he Mariupol sector was the most unquiet. 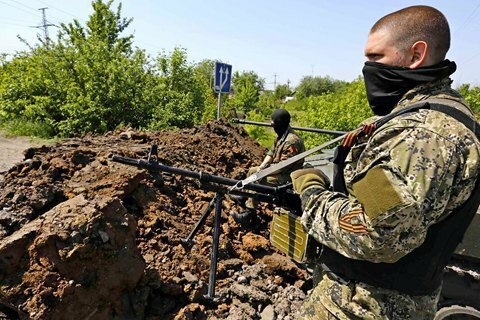 Over the past day, Russia-backed militants made 72 attacks at the positions of Ukrainian military in the zone of the antiterrorist operation in Donbass, the press center of the ATO headquarters reported via Facebook on 14 July. 37 attacks were recorded in the direction of Mariupol. The terrorist forces fired 152 mm artillery, banned under Minsk agreements, to shell the positions of ATO troops in Mariyinka, and 122-mm self-propelled artillery systems in Krasnohorivka. In Starohnativka, Bohdanivka, Novohryhorivka, Vodyne, Shyrokyno, Mariyinka and Krasnohorivka militants fired 120-mm mortars. In the Donetsk direction, the separatists made 30 attacks. They fired 122-mm artillery in Opytne and Pisky. In Avdiyivka and Zaytsevo they used 120mm mortars. Also, in this area the ATO fortifications were shelled from 82 mm mortars, grenade launchers of various systems and small arms. In the Luhansk sector, ATO forces saw five attacks. In Novotoshkivka, militants fired 82-mm mortar and anti-aircraft installations. Outside Stanytsa Luhanska, the militants fired grenade launchers. "Despite the increased enemy activities, ATO forces retain full control over the situation all along the contact line," the release said. On 13 July, the NSDC Secretary Oleksandr Turchynov visited the combat zone because of the aggravation of the situation.